This month for the Secret Recipe Club I was assigned the blog Without Adornment written by the very talented, Bean. Her blog is all about being herself, being alive and being without adornment. You should definitely give it a peek. All her recipes are gluten-free and many are even vegan, egg free, dairy free and soy free. I have very little experience with specialty diets except for a short stint in Maddy’s first year where the doctor thought she may be reacting to wheat and gluten that I was eating while nursing her. During that time I ate gluten-free. Fortunately, I found many things that were different from what I was used to however, were still mighty tasty! I didn’t do any baking during my gluten-free stage so I have no experience with baking gluten-free so this was a first for me. As I looked through Bean’s blog, I found so many lovely things that I would have loved to bake. It was hard to make a decision! I decided to go with her Vegan Gluten Free Rhubarb Apple Galette. However, it’s November so therefore rhubarb is nowhere to be found. I have been wanting to try persimmons for the longest time and this was the perfect occasion to give that a go. Every time I see persimmons at the farmer’s market I am always intrigued by this fruit that looks like orange tomatoes. As I tried my first slice I was immediately enamored with them! I assure you, even though they may look like a tomato they certainly do not taste like one. They’re soft, juicy and oh so pleasantly sweet! The persimmons got partnered up with some gala apples and a little cinnamon. They all hopped into the galette and were baked up to a golden, bubbly brown. The wonderful thing about a galette is it’s like a lazy man’s pie. No pie plate, no crimping edges. Just put everything in the middle of your dough disk, fold up the sides and pop it in the oven. Very rustic looking and oh so easy! This comes in handy when you’ve just had a baby and have a very rambunctious 2-year-old running around. 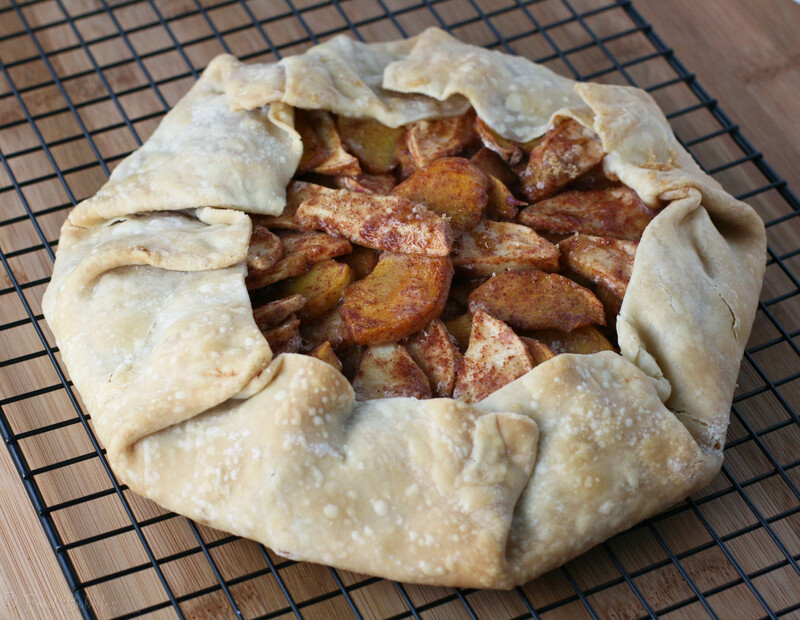 So go take a look at Bean’s beautiful blog as you sample this lovely galette. – Roll out the pie dough into a circle until the crust is slightly more than 1/4″ thick between a piece of plastic wrap (top) and parchment paper (bottom). Remove the plastic wrap and press the edges of the disk to smooth them out and make it more circular. – In a medium-sized bowl, mix together the persimmons, apple, tapioca starch and cinnamon until persimmons and apple are evenly coated. – Drizzle on the agave nectar and toss until evenly coated. – Arrange the fruit mixture onto the middle of the pie dough, leaving a 2″ border. – Fold the edges of the dough over the filling mixture. Use your fingers to press the dough together to keep it folded. – Transfer parchment paper onto a cookie sheet and bake in preheated oven at 350F for 25 minutes. 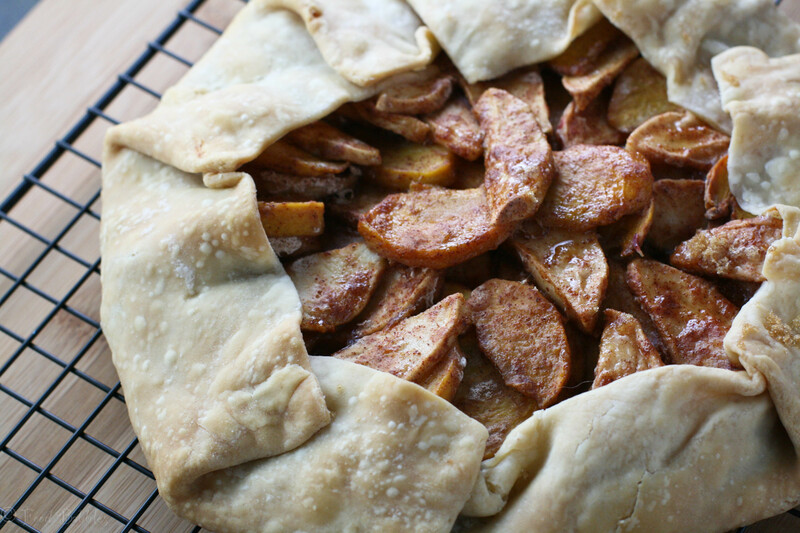 – Rotate the pan and cook for another 20 minutes or until filling is bubbly and pie crust is golden brown. Note: Add about 1 tbsp. of water to the filling when rotating it. – Remove from oven and let cool before serving. Oh how I miss having access to rhubarb! Living in NC, I can’t find it. I’ve never tried persimmons but I think that’s a great sub! Love the rustic look of your dessert! Yum!! This sounds and looks amazing! The Apple and persimmon combo would be delicious! Thanks Katie! The combo did work out nicely. Having never tried persimmons before I wasn’t sure what to expect but it worked out very well. Yum! What a great looking galette. I am a BIG galette lover and living in France I get to try lots of them ~ however this is WONDERFUL and so seasonal too! Came here through the SRC and so pleased to find you! Thanks for stopping by, Karen! I appreciate it and your lovely comment as well. I love galettes also… so easy and so tasty! Hi Paula!! Thanks for your comment and I’m headed over your way right now to see what recipe of mine you chose to do. Can’t wait to see! Thanks Bean! So glad you liked my spin on your recipe. I really enjoyed this and once rhubarb comes back in season I’ll be making this again but doing it your way. Great recipe! Hi! Just popped over from my SRC blog hop. This looks really nice and healthy. Great pick! I’ve never tried galette. This motivates me. Yumm! I’ve always wanted to make a galette (they’re gorgeous!) I love that you made this gluten free. That looks delicious. There is something about Pie dough folded in that fashion that has me completely mesmerized. SRC is such a get group to be a part of. I tried cooking with persimmons once. It was not stellar but I think I really need to give it a try again! They worked really well in this particular recipe so you should definitely revisit baking with persimmons. This was my first experience and it came out good.